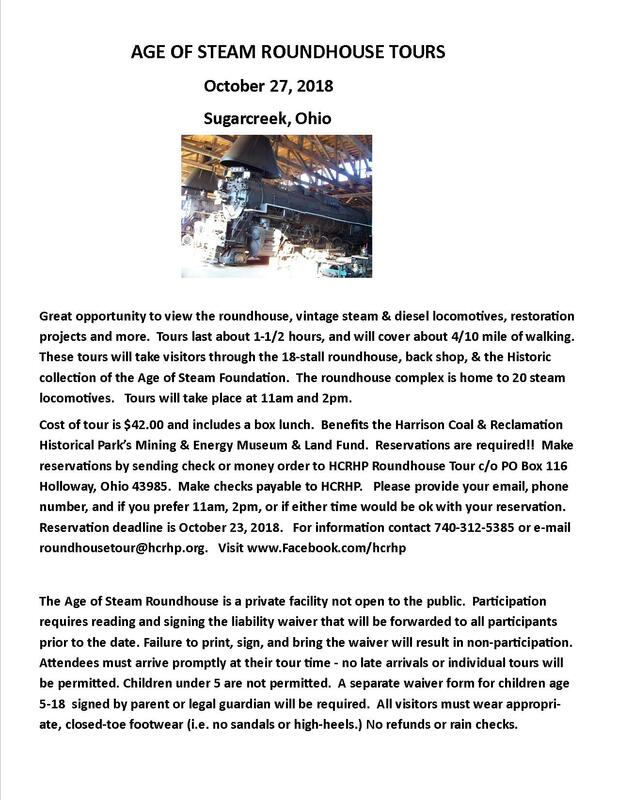 Historical Construction Equipment Association - AGE OF STEAM ROUNDHOUSE TOURS October 27, 2018 Sugarcreek, Ohio RESERVATIONS REQUIRED!!!! AGE OF STEAM ROUNDHOUSE TOURS October 27, 2018 Sugarcreek, Ohio RESERVATIONS REQUIRED!!!! Great opportunity to view the roundhouse, vintage steam & diesel locomotives, restoration projects and more. Tours last about 1-1/2 hours, and will cover about 4/10 mile of walking. These tours will take visitors through the 18-stall roundhouse, back shop, & the Historic collection of the Age of Steam Foundation. The roundhouse complex is home to 20 steam locomotives. Tours will take place at 11am and 2pm. The Age of Steam Roundhouse is a private facility not open to the public. Participation requires reading and signing the liability waiver that will be forwarded to all participants prior to the date. Failure to print, sign, and bring the waiver will result in non-participation. Attendees must arrive promptly at their tour time - no late arrivals or individual tours will be permitted. Children under 5 are not permitted. A separate waiver form for children age 5-18 signed by parent or legal guardian will be required. All visitors must wear appropriate, closed-toe footwear (i.e. no sandals or high-heels.) No refunds or rain checks. 12 weeks away. Opening still available. Reservations required!! 8 and half weeks away. Get your reservations in. Reservations required!! !Don't forget to include email address and phone number. Additional information will be emailed before the October 27th. 47 days away!! Get your reservations in. Deadline is October 23. Get your reservations in as soon as possible.